Picnic Blanket - 48" x 57"
Picnic Blanket - 50" x 60"
About this Field Co.(R) Picnic Blanket:Make your picnic perfect with this plaid Field & Co.® Picnic blanket. This blanket features comfortable polarfleece with foam padding and PEVA backing. The 11" x 4.5" pocket is perfect for storing mobile devices or any other picnic necessities. Material: Polyester Fleece. Manufactured By Leeds.Special Instructions:Other imprint methods/areas may be available; please call for details. Please note that product images may not depict the standard imprint method included in pricing. About this The Park Polyester Fleece Blanket:Includes foam lining and water-resistant PVC backing.Velcro closure.Front pocket on flap.Carry handle.Material: Polyester fleece.Special Instructions:1 Day Rush, available upon request for 1 color, 1 imprint location orders. About this Brookwater Fleece Blanket:50" x 60" soft 260gsm anti-pilling fleece blanket with whipstitch edging, 100% polyester. Additional Stock may be available domestically. Please call your sales rep. Finish / Material: Fleece.Special Instructions:Rush Service:1. Purchase Order must clearly state artwork instructions and logo to be used.2. One Color/One Location Imprint Only.Other imprint methods may be available; please call for details. Please note that product images may not depict the standard imprint method included in pricing. About this Faircrest Fleece Blanket:50" x 60" 200gsm fleece blanket brushed on both sides, with color matching whipstitch edging. Finish / Material: Fleece. Additional Stock may be available domestically. Please call your sales rep.Special Instructions:Rush Service:1. Purchase Order must clearly state artwork instructions and logo to be used.2. One Color/One Location Imprint Only.Other imprint methods may be available; please call for details. Please note that product images may not depict the standard imprint method included in pricing. About this Picnic Blanket:When you're all packed up for a picnic, plop down on this comfortable polyester fleece blanket with foam padding and water-resistant backing. Manufactured By Leeds. Note: Instructions Included: No Materials: Polyester FleeceSpecial Instructions:Other imprint methods/areas may be available; please call for details. Please note that product images may not depict the standard imprint method included in pricing. About this Cozy Fleece Blanket:100% polyester anti-piling fleece with whip stitched edging. Perfect for taking to an outdoor sporting event or cuddling up on the couch. Manufactured By Leeds. Materials: Polyester FleeceSpecial Instructions:Other imprint methods/areas may be available; please call for details. Please note that product images may not depict the standard imprint method included in pricing. About this BRIGHTtravels Packable Fleece Blanket:This warm packable fleece blanket is ideal for just about any occasion. The full size blanket folds down to a compact 11" x 9.5" tote with carrying strap and two 11" x 7.5" exterior pockets. This perfect blanket for traveling can easily be packed in a suitcase or bag. Material: Polyester Fleece. Manufactured By Leeds.Special Instructions:Other imprint methods/areas may be available; please call for details. Please note that product images may not depict the standard imprint method included in pricing. About this Roll - up Blanket:This 48" x 53" Roll-up Fleece Blanket easily folds within itself with Velcro closure. Carry handle and compact folded size makes it easy to take with you on the go. Front 4. 5" pocket is perfect for storing mobile devices or any other picnic necessities.Material: Polyester Fleece.Special Instructions:Other imprint methods/areas may be available; please call for details. Please note that product images may not depict the standard imprint method included in pricing. About this Picnic Blanket - 48 x 57:Take this roll up blanket anywhere. It features soft fleece with polyester backing and a convenient carry handle with adjustable shoulder strap. The 48" x 57" blanket rolls up to about 5 1/2" x 15". Finish / Material: Fleece, 190T Poly. Removable & Adjustable Shoulder Strap.Special Instructions:Rush Service:1. Purchase Order must clearly state artwork instructions and logo to be used.2. One Color/One Location Imprint Only.Other imprint methods may be available; please call for details. Please note that product images may not depict the standard imprint method included in pricing. About this Brookridge All Occasion Blanket:Anti-pilling fleece blanket with whipstitch edging, 100% polyester. Finish / Material: Polyester. Ribbed Texture.Special Instructions:Rush Service:1. Purchase Order must clearly state artwork instructions and logo to be used.2. One Color/One Location Imprint Only.Other imprint methods may be available; please call for details. Please note that product images may not depict the standard imprint method included in pricing. About this Picnic Blanket - 50 x 60:50" x 60" 260gsm fleece picnic blanket, with 210D polyester, carry handles, hook and loop strap and 2 pockets. Finish / Material: 210D Poly, Fleece.Special Instructions:Rush Service:1. Purchase Order must clearly state artwork instructions and logo to be used.2. One Color/One Location Imprint Only.Other imprint methods may be available; please call for details. Please note that product images may not depict the standard imprint method included in pricing. About this Fleece Blanket:Cozy up with the soft fleece blanket.Unfolds to 50" high by 60" wide. Material: Fleece.Special Instructions:1 Day Rush, available upon request for 1 color, 1 imprint location orders. About this Game Day Stadium Blanket:This perfect blanket can be used as a picnic blanket,seat cushion,or over your lap to keep warm while cheering on the big game. Easily folds in to a convenient 13" x 11" nylon bag with carrying straps and a 12" x 8.5" exterior pocket. Manufactured By Leeds. Note: Instructions Included: No Materials: Polyester FleeceSpecial Instructions:Other imprint methods/areas may be available; please call for details. Please note that product images may not depict the standard imprint method included in pricing. About this Roll - up Beach Blanket with Pillow:Beach Mat Blanket includes pillow that neatly tucks inside the rolled-up blanket. This Roll Up Beach Mat with Pillow includes a convenient carrying handle.Material: Polyester.Special Instructions:Other imprint methods/areas may be available; please call for details. Please note that product images may not depict the standard imprint method included in pricing. About this Huddle Sweatshirt Blanket:Warm up any promotion with a blanket that feels like your favorite sweatshirt.Material: Polyester.Special Instructions:1 Day Rush, available upon request for 1 color, 1 imprint location orders. About this Fold up Picnic Blanket:Water resistant backing.Blanket conveniently folds into compact size with hook and loop closure and carry handle.Unfolded blanket size: 47" x 52".Material: Fleece.Special Instructions:1 Day Rush, available upon request for 1 color, 1 imprint location orders. About this Sherpa Blanket:This Sherpa blanket is perfect to keep warm on a cold night. Super soft Sherpa provides extra warmth. Blanket measures 50" x 60" unfolded.Material: Fleece.Special Instructions:1 Day Rush, available upon request for 1 color, 1 imprint location orders. About this Sweatshirt Blanket:50" x 60" 80% cotton/20% polyester hemmed blanket. Heavyweight for even the coldest of nights. Manufactured By Leeds. Materials: Cotton/Polyester Blend Related Search Terms: Sweatshirt Blanket , BlanketSpecial Instructions:Other imprint methods/areas may be available; please call for details. Please note that product images may not depict the standard imprint method included in pricing. About this Deluxe Stadium Cushion / Blanket:Converts easily from seat cushion to blanket.Front and back open pockets.Zippered closure.28" shoulder strap.Unfolded blanket size: 47" W x 58" L.Material: Polar fleece blanket with 210D polyester backing. Related Search Terms: Blanket ,Seat Cushion Special Instructions:1 Day Rush, available upon request for 1 color, 1 imprint location orders. About this Fleece Travel Blanket:This warm packable fleece blanket is ideal for any occasion. The full size blanket folds down to a compact 10.24" x 11.6" tote with carrying handle. This perfectly sized blanket for traveling can easily be packed in a suitcase or bag. Material: Fleece.Special Instructions:1 Day Rush, available upon request for 1 color, 1 imprint location orders. About this Plaid Fleece Blanket:The plaid fleece blanket is 50" high by 60" wide featuring a trendy pattern making it perfect for any occasion. Material: Fleece.Special Instructions:1 Day Rush, available upon request for 1 color, 1 imprint location orders. About this Game Day 3- In -1 Blanket:As part of Leed's Game Day collection, this blanket is ideal picnicking or for your next sporting event. The waterproof blanket converts into a hooded poncho to keep you warm and dry during those unexpected downpours. Folds up into a convenient drawstring carrying bag that can also be used as a stadium seat. Material: Polyester Fleece. Manufactured By Leeds.Special Instructions:Other imprint methods/areas may be available; please call for details. Please note that product images may not depict the standard imprint method included in pricing. About this Stow n Go Picnic Blanket:Ultra compact and water resistant, this blanket is ready for the outdoors. Perfect for picnics, concerts, sporting events or even to the beach, this is the ultimate go anywhere blanket. The 44" X 55" polyester blanket folds down to a compact 4" X 6" and stows neatly into the attached pouch. Use the caribiner to clip it to a bag or slip it into a pocket and go. Material: Polyester. Manufactured By Leeds.Special Instructions:Other imprint methods/areas may be available; please call for details. Please note that product images may not depict the standard imprint method included in pricing. About this High Sierra Oversize Picnic Blanket:Perfect for your next outdoor adventure this High Sierra exclusive design is a 60" x 70" oversize picnic blanket and made for the elements with water resistant durable ripstop and fleece interior. Comes with a carrying wrap and handle. Free run charges for Embroidery up to 7500 stitches.Material: Polyester Fleece.Special Instructions:Other imprint methods/areas may be available; please call for details. Please note that product images may not depict the standard imprint method included in pricing. About this Oversized Picnic Incrediblanket(R) with Ground Stake:Incrediblanket is a patented, oversized, weather resistant blanket that uses a proprietary system of removable ground stakes to anchor the blanket in place. The Incrediblanket first appeared on Kickstarter. Considered the ultimate outdoor blanket. It works across environments including beach, picnic and outdoor. Exclusive design. Free run charges for Embroidery up to 7500 stitches.Material: Polyester Fleece.Special Instructions:Other imprint methods/areas may be available; please call for details. Please note that product images may not depict the standard imprint method included in pricing. About this Rally Blanket With Pouch:Rally Blanket with Pouch. Soft fleece blanket.Includes black pouch.Blanket not inserted in Pouch.Material: Fleece.Special Instructions:1 Day Rush, available upon request for 1 color, 1 imprint location orders. About this Ribbed Fleece Blanket:Soft fleece blanket with whip stitched edging. Blanket size: 50" x 60". Material: Fleece.Special Instructions:1 Day Rush, available upon request for 1 color, 1 imprint location orders. Thank you Donna, Shelly and Laura. We love to read positive reviews on our promotional products. This Top 100 item is popular because of how quick it could roll up to store away. The Custom Roll-Up Picnic Blanket is great for any outdoor event! Whether it is summer or winter, you could use this promotional picnic blanket to sit on. Customers will love to own one of these! The Custom Roll-Up Blanket is a 52" x 47" Polyester Fleece plaid blanket with lining and water-resistant PVC backing. The Custom Roll-Up Blanket easily folds within itself, velcro® closure. The Custom Roll-Up Blanket features an attached handle for easy carrying. Thank you Adrian and Carolyn! We’re glad to read your reviews on the Tanglewood Fleece Roll Up Blanket. These blankets are great for any occasion! The Tanglewood Fleece Roll Up Blanket is great for any give away. Give these to your employees as incentive! Wrap your clientele and your campaign in this Tanglewood Fleece Roll Up Blanket! Made of 100% polyester fleece with Velcro closure and carrying handle, this soft comforter rolled up. With a washable surface and a thickness of 380 grams, this super-snug coverlet is perfect marketing for beach resorts and outdoor festivals. Order your Tanglewood Fleece Roll Up Blanket here. Thank you Amelia and Patricia! This promotional blanket has skyrocketed in popularity. So many customers want to have one of these! Large 48" x 53" 100% Polyester Fleece. Easily Folds Within Itself, Hook And Loop Closure. Attached Handle For Easy Carrying. Available in dark blue, black, hunter green, charcoal, red, royal blue, and purple. With over 100 promotional blankets and linens available in our selection, you’ll find the perfect one to fit your comfort level. We have different styles of blankets and linens. Picnic blankets, throw blankets, fleece roll-up blankets, stadium blankets, all occasion blankets, sherpa blankets, and so much more! Blankets and linens are great to take just about everywhere. Need to take comfort along? Well blankets and linens will definitely help no matter where you are going. Choose the perfect one that will complement your company! Blankets and linens are great for everyone. Whether for an outdoor picnic, outdoor movie, or indoor activity, blankets and linens will help make you cozy. Place your company logo on your favorite style of promotional blanket or linen to give away at your next event! Look through our selection of blankets & linens. Shop here! Trade show and special event guests are bombarded with lackluster swag at every opportunity, so it is extremely important to stand out. Our custom blankets and linens are specially priced and proven to generate impressions and fun. Search our site for a wide selection of promotional blankets and linens and see for yourself how high our standards are when it comes to brand impact! Click through our inventory of promotional blankets on sale now. Here is a snapshot of our selection of 141 custom blankets and linens currently available. We’re ready to help expedite your order, so give us a call! Grab your promo picnic blankets today! Promotional blankets and linens are great for any indoor or outdoor occasion. You could never go wrong with a blanket or linen. You could either choose to sit on a blanket or linen or cover yourself in one! If you’re aiming to do a giveaway, then promotional blankets and linens are great to give to customers. They are practically in every household. 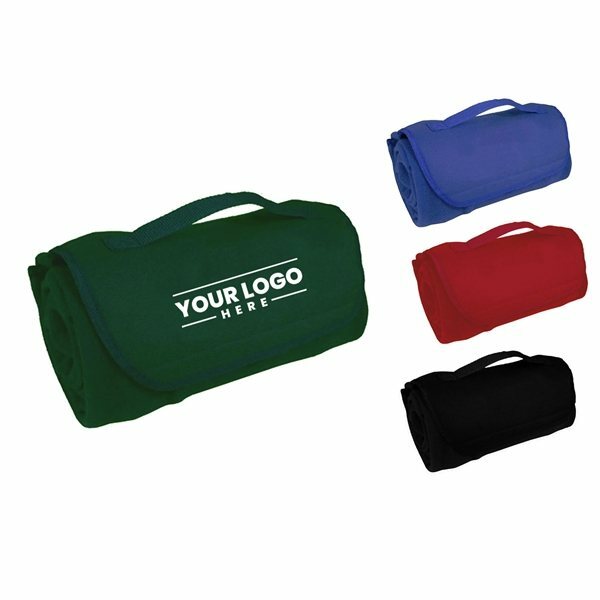 Let your promotional blanket or linen have a home. Our featured list of blankets and linens are fun for all to have! For promotional blankets and linens, there’s nowhere else to shop but here.